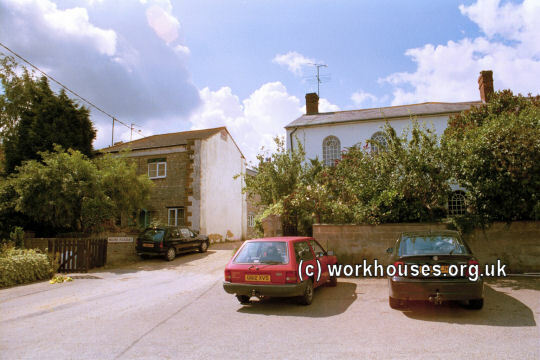 Passenham had a workhouse from 1715 in a new building on Hayes Lane, Deanshanger. The parish later rented premises on Hospital Lane (now Church Lane) which became known as the Hospital. By 1830, it was using a converted building next to the Green at Deanshanger. Paulerspury had a workhouse from 1733 at the east side of the village on land provided by Lord Bathurst. In 1835 the parish set up a scheme to send twelve paupers, adults and children, to North America. A parliamentary report of 1777 recorded parish workhouses in operation at Cosgrove (for up to 9 inmates), Paulerspury (20), and Stony Stratford St Giles (14). Potterspury had a workhouse by 1789. In this township is a sort of Workhouse, in which there are at present only 2 persons. The manager of the house finds such Poor as the township may send him in victuals and fuel, for which he receives 3s. a week for each person. The township provides clothes, beds and other furniture. County of Northampton: Alderton, Ashton, Cosgrove, Furtho, Grafton Regis, Hartwell, Passenham, Paulers-Pury [Paulerspury] (2), Potters-Pury [Potterspury] (2), Wicken, Yardley-Gobion. Later Additions (from 28th September 1835) County of Buckingham: Stony Stratford — St Giles on West Side (2), Stony Stratford — St Mary Magdalen on East Side, Calverton, Woolverton. The population falling within the (original) Union at the 1831 census had been 5,954 with parishes ranging in size from Furtho (population 16) to Paulerspury (1,092). The average annual poor-rate expenditure for the period 1833-5 had been £5,375 or 18s.1d. per head of the population. Potterspury was unusual in its small size, odd shape, and in lacking a market town. This had resulted from lobbying by the Duke of Grafton for all the lands that formed his estate to be the basis of the union. This was agreed to by the area's Assistant Poor Law Commissioner, Richard Earle, who made similar concessions, although on a lesser scale, in the formation of the unions at Brixworth (the Spencer family), Brackley (the Cartwrights), Daventry (the Knightleys), and Peterborough (the Fitzilliams). The Potterspury Union adopted an existing building at Yardley Gobion, perhaps the one referred to by Eden, for whose enlargement and adaptation the Poor Law Commissioners authorised a total expenditure of £2,150. The upgraded workhouse could accommodate up to 200 inmates. The main building had a long U-shaped layout as shown on the 1901 map below. Potterspury Union workhouse site, 1901. Potterspury workhouse general view from the north, 2000. 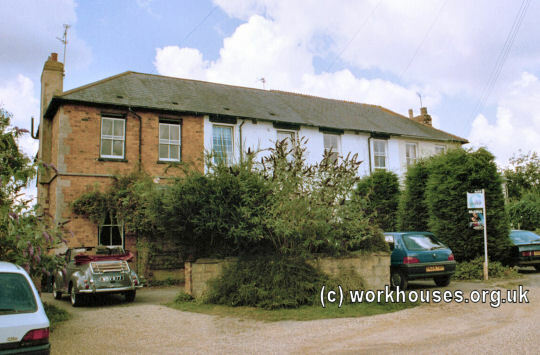 Potterspury union workhouse from the north, 2000. Potterspury union workhouse west range from the south-west, 2000. At the end of 1842, the new post of workhouse schoolmistress was given to Mary Ann Manning at a salary of £15 a year plus lodging. As well as teaching, she was required to assist the matron in cutting out and making the children's clothes. There was a large turnover of occupants of this post. From 1848 to 1852, the workhouse master and matron also acted as schoolmaster and schoolmistress. In 1848, an old hovel at the rear of the workhouse was converted into a casual ward for vagrants, and part of the workhouse yard was adapted to house the village fire engine. A new laundry was added in 1850. In 1856, after the Poor Law Board had advised a number of repairs to the workhouse, the Guardians voted to dissolve the union although by less than the required two-thirds majority. In 1866, the casual ward was closed and a replacement opened at Old Stratford which was nearer to the main tramp route along Watling Street. Further repairs were required in 1868 and again the possibility of dissolving the union was considered. However, the Duke of Grafton persuaded the Guardians to undertake building works which included converting the old casual ward and providing a new schoolroom, dormitories, dayroom and schoolmistress's quarters. The new school, designed by ES Harris the younger, was completed in December 1871 and is thought to be the T-shaped building which survives at the south-west of the workhouse. The Old Stratford casual ward was closed in 1884 and a new casual ward erected at the workhouse. Potterspury 1872 school(?) from the north-east, 2000. Further debate on dissolving the union occurred in 1889 when the Northamptonshire County Council proposed that the member parishes from Northamptonshire should be added to the Towcester Union. In 1894, the Board's Buckinghamshire Guardians voted that their parishes should join the Newport Pagnell Union. Neither of these schemes was successful and the workhouse continued in use until January 1917 when the then matron died and the master retired. The Local Government Board suggested that the premises, which were now considered unsatisfactory, were temporarily closed. The inmates were dispersed amongst the Towcester, Hardingstone, and Newport Pagnell workhouses and the building was handed over to Northamptonshire Voluntary Aid Detachment for use as a convalescent home for wounded troops. In May 1918 the site became a camp for around 50 German prisoners of war who worked on local farms. In 1922, the Guardians transferred their meetings to Stony Stratford. A proposal to convert the workhouse to a children's home was rejected by the Ministry of Health and children from the Potterspury Union were instead sent to the Newport Pagnell workhouse. 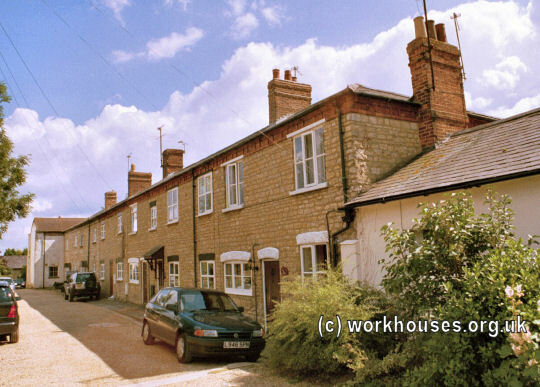 The workhouse was instead sold off and the buildings converted into rented residential accommodation. 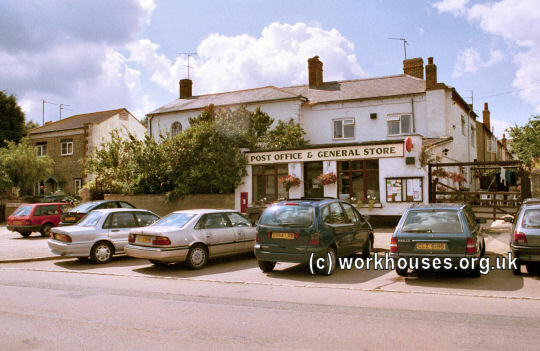 The proceeds from the sale were used to purchase new premises for the union at Stony Stratford which in 1930 were taken over by the Potterspury Rural District Council. The surviving buildings have now been converted to a shop and housing. From 1904, in an attempt to reduce the stigma of being born in a workhouse, the Registrar General recommended that the place of birth recorded on birth certificates should not reveal such a fact. For such purposes, the Potterspury workhouse therefore adopted the official address of The White House. Centre for Buckinghamshire Studies, County Hall, Walton Street, Aylesbury, Bucks HP20 1UU. Very few local records survive — holdings include Guardians' minutes (1840-1930).